Citation Information: J Clin Invest. 2018;128(12):5634-5646. https://doi.org/10.1172/JCI98595. People with diabetes mellitus have increased infection risk. With diabetes, urinary tract infection (UTI) is more common and has worse outcomes. Here, we investigate how diabetes and insulin resistance impact the kidney’s innate defenses and urine sterility. We report that type 2 diabetic mice have increased UTI risk. Moreover, insulin-resistant prediabetic mice have increased UTI susceptibility, independent of hyperglycemia or glucosuria. To identify how insulin resistance affects renal antimicrobial defenses, we genetically deleted the insulin receptor in the kidney’s collecting tubules and intercalated cells. Intercalated cells, located within collecting tubules, contribute to epithelial defenses by acidifying the urine and secreting antimicrobial peptides (AMPs) into the urinary stream. Collecting duct and intercalated cell–specific insulin receptor deletion did not impact urine acidification, suppressed downstream insulin-mediated targets and AMP expression, and increased UTI susceptibility. Specifically, insulin receptor–mediated signaling regulates AMPs, including lipocalin 2 and ribonuclease 4, via phosphatidylinositol-3-kinase signaling. These data suggest that insulin signaling plays a critical role in renal antibacterial defenses. Type 2 DM and prediabetes increase UPEC susceptibility. (A) Representative Western blots probed for β-IR, pAKT (ser473), and GAPDH in db/+ and db/db mice. Each lane depicts kidney β-IR expression and AKT phosphorylation from separate mice. (B) Female db/+ and db/db mice were transurethrally inoculated with UPEC. At 24 hours after infection, urinary and bladder UPEC burdens were enumerated. Each point depicts bacterial burden in a separate mouse. The horizontal line indicates the geometric mean of each group. 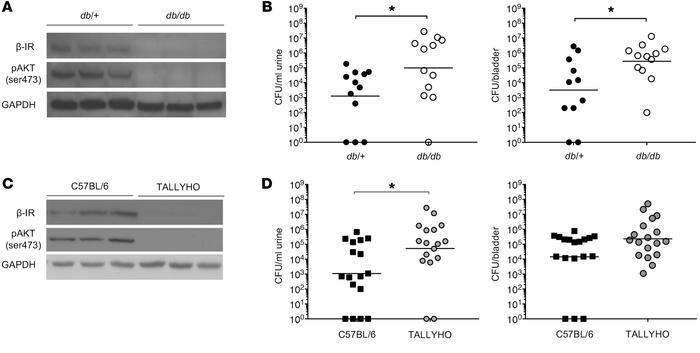 (C) Representative Western blots probed for β-IR, pAKT (ser473), and GAPDH from control and TALLYHO mice. Each lane depicts kidney β-IR expression and AKT phosphorylation from separate mice. (D) Urinary and bladder UPEC burdens in female control and TALLYHO mice 24 hours after infection. Asterisks denote significance for the indicated pairwise comparison (Mann-Whitney U test). *P < 0.05.